Darkly stained teeth. 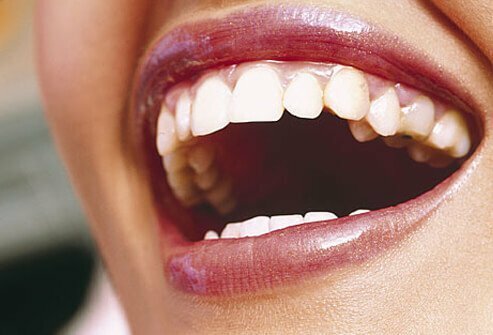 Yellow-ish teeth respond well to bleaching, brownish-colored teeth respond less well, and grayish-hue or purple-stained teeth may not respond well to bleaching at all. Blue-gray staining caused by tetracycline is more difficult to lighten and may require up to 6 months of home treatments or several in-office appointments to successfully lighten. Teeth that have dark stains may be better candidates for another lightening option, such as veneers , bonding , or crowns . Your dentist can discuss the options best suited for your situation. Toothpastes help remove surface stains through the action of mild abrasives. Some whitening toothpastes contain gentle polishing or chemical agents that provide additional stain removal effectiveness. Whitening toothpastes can help remove surface stains only and do not contain bleach; over-the-counter and professional whitening products contain hydrogen peroxide (a bleaching substance) that helps remove stains on the tooth surface as well as stains deep in the tooth. None of the home use whitening toothpastes can come even close to producing the bleaching effect you get from your dentist's office. Whitening toothpastes can lighten your tooth's color by about one shade. In contrast, light-activated whitening conducted in your dentist's office can make your teeth three to eight shades lighter. Both of these products contain peroxide in a concentration that is much lower than the peroxide-based products that are used in your dentist's office. Although some teeth lightening will be achieved, the degree of whitening is much lower than results achieved with in-office or dentist-supervised whitening systems. Additionally, use of over-the-counter products do not benefit from the close supervision of your dentist ? to determine what whitening process may be best for you, to check on the progress of the teeth whitening process and look for signs of gum irritation. On the positive, the over-the-counter gels and strips are considerably less expense (ranging from $10 to about $55) than the top-of-the line in-office whitening procedures, which can cost nearly $800. For more traditional types of teeth whitening procedures using tray-based tooth whitening systems purchased over-the-counter or through your dentist's office, the first step involves filling a mouth guard-like tray with a gel-like whitening solution ? which contains a peroxide-bleaching agent. This tray is then placed over the teeth and worn for a period of time, generally from a couple hours a day or every day during the overnight for up to 4 weeks and even longer (depending on the degree of staining and desired level of whitening). Bleaching procedures performed in the dentist's office involve a few different or additional steps ? namely, that a protective gel or guard is positioned over the gums before the bleaching agent is applied, the bleaching agent is applied directly to the teeth, and the whitening process is hastened with the use of heat, a special light, or laser light that is directed at the chemically coated teeth. There are other differences that are addressed in the next question. Strength of bleaching agent. For starters, over-the-counter home use products and dentist-supervised at-home products usually contain a lower strength-bleaching agent (from 10% carbamide peroxide-which is equivalent to about 3 percent hydrogen peroxide ? up to 22% carbamide peroxide). In-office, professionally applied tooth whitening products contain hydrogen peroxide in concentrations ranging from 15 to 43 percent. Mouthpiece trays. With dentist-supervised at-home bleaching products, your dentist will take an impression of your teeth and make a mouthpiece tray that is customized to exactly fit your teeth. This customization allows for maximum contact between the whitening gel, which is applied to the mouthpiece tray, and the teeth. A custom-made tray also minimizing the gel's contact with gum tissue. Over-the-counter whitening products do contain a mouthpiece tray, but the "one-size-fits-all" approach means that the fit will not be exact. Ill-fitting trays can irritate the gum and soft tissue by allowing more bleaching gel to seep onto these tissues. With in-office procedures, the bleaching agent is applied directly to the teeth. Speed of the bleaching process. Dentist-supervised at-home bleaching and over-the-counter bleaching products typically need to be applied every day for 1 or 2 hours or every overnight for up to 4 weeks. In-office bleaching provides the quickest and most effective way to whiten teeth. With in-office bleaching, the whitening product is applied directly to the teeth. These products can be used in combination with heat, a special light, and/or a laser. The light and/or heat accelerate the whitening process. Results are seen in only 1, 30- to 60-minute treatment. To achieve dramatic results, however, several appointments are usually needed. With laser-enhanced bleaching, however, dramatic results can be seen after the first treatment. Costs. Over-the-counter bleaching systems are the least expensive option, with costs ranging from $20 to about $150. Depending on where you live and the extent of the procedure, dentist-supervised home bleaching systems range in cost from approximately $150 to $300 per upper or lower set of teeth, or $300 to $600 for the whole mouth. In-office bleaching procedures range in cost from $200 to $500 per arch, or $500 to $1,000 for the whole mouth. Supervised versus unsupervised process. Dentist-supervised at-home bleaching and in-office treatments offer additional benefits compared with over-the-counter procedures. First, your dentist can perform an oral examination and consider your complete medical history, which can be helpful in determining how your teeth became discolored and if bleaching is an appropriate course of treatment based on your type of stains and number, type, and location of restorations. Your dentist can then better match the type of stain with the best treatment, if appropriate, to lighten those stains. With dentist-supervised bleaching procedures, your dentist will likely want to see you a couple of times to ensure you are following directions, to make sure the customized tray is fitting properly, to inspect your gums for signs of irritation, and to generally check on how the teeth whitening process is proceeding. With over-the-counter bleaching products, you are on your own. Try to select a kit that allows some customization of the mouthpiece. Some kits come with a mouthpiece that can be molded to some degree. These are better than others that come with a standard stock mouthpiece. Edited by Charlotte E. Grayson, MD, February 2003, WebMD. Dental veneers are thin, custom-made shells that cover the front surface of teeth, changing their color, shape, size, or length. Veneers are used to correct teeth that are discolored, worn down, chipped, misaligned, or uneven. Veneers can also be used to fix gaps in between teeth. Veneers typically last between 5 and 10 years. Explore tips for beautiful teeth and gums. Brighten your smile and keep healthy gums with these easy and simple tools.